Lost Links (Relaxed Machinery 0018) is a new collection of “lost pieces” from ambient-electronic wizard Max Corbacho, created during 2003-09 for other albums, but left out “for various reasons”. Fortunately, Max saved them for another day. Created with synths, sequencers and atmospheres, the seven pieces on Lost Links, running 67 minutes in total, cover Max’s typically vast sonic range while sharing – given the circumstances – surprisingly common ground. All of the music has Max’s trademark sublimity, luminosity and depth. You may find it difficult at first to choose favorites, as I did. They may emerge later. I admit to being partial to longer pieces, and there are three gems here, in the 12-16 minute range. The longest, the beautifully meditative One True Light, flows by effortlessly in no time, with wildly-bouncing glassy/reedy melodic sequences (like particles in the light) and brightly-lit pads. It’s followed by Mandala, thick with texture and color, rich tendrils of each chord spiraling out from the center, dazzling in its veiled effulgence. As is usual for Max’s albums, the artwork simply must be mentioned here. 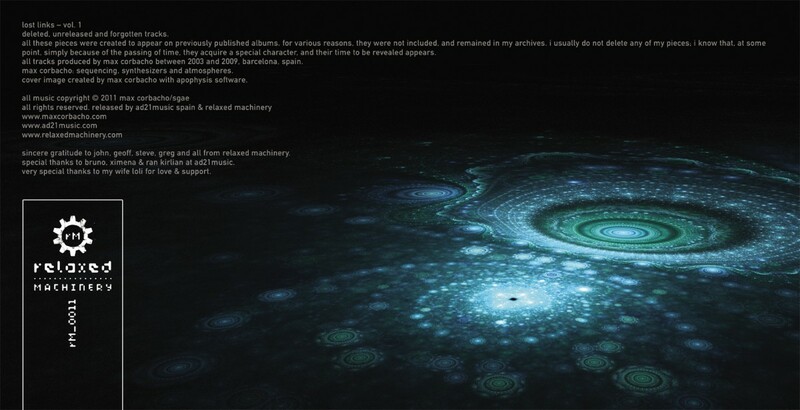 Max created the cover image himself with Apophysis software. It is vast, brilliant, gorgeously designed and sublimely beautiful. Steve Brand, Relaxed Machinery’s resident album designer, handles the package layout with his usual deft hand. Lost Links is a perfect introduction to Max Corbacho’s music. If Max’s music is new to you, when you hear the quality of these pieces – leftovers from Max’s other albums – you will find it hard to resist discovering how great those albums are. That is an ongoing, joyful process: in my view, Max is one of our top-ranked ambient-electronic artists. His music is, quite simply, unforgettable, essential listening.